Room features a queen-size bed or 2 twin beds, single convertible sofa, wall pull-down bed (if sleeping 4), bath with tub and shower. These are the smallest rooms onboard and the only ones not to have separate bathroom and toilet room. 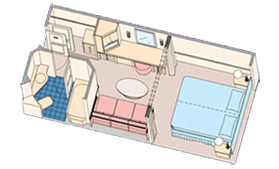 Category 11 rooms are located on decks 2, 5, 6 & 7. Category 11C, located on Deck 2, sleeps only 3.